RacePak's New Smartwire has just been released! 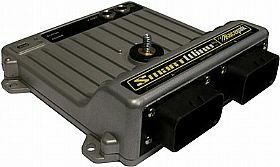 Solving the wiring complexity of the modern race car, the Racepak SmartWire is a fully programmable power control module. While traditional wiring provides control of vehicle electronic components through the routing of wiring to single or multiple fuses, relay and circuit breaker panels, the Racepak Smartwire functions as a central �command center� for all vehicle wiring. Based on Racepak�s exclusive single cable V-Net technology, the Racepak SmartWire module is the electronic �starting point�, with a direct main power connection from the vehicle battery to the module. Each input/output is then user defined, both in function, power requirements and current exceeding limits via a USB connection to the user�s PC. The design of the module functions to both reduce overall installation weight / clutter, while providing a quicker reacting electronic system, through the solid state switching design. Manual activation can be achieved through use of either an optional eight switch Racepak Switch Panel or 16-channel Switch Module. From the Racepak Smartwire unit, a single small cable is routed to the SwitchPanel, reducing wiring clutter. Users needing additional switch panel capabilities can easily expand through the use of a �jumper� cable to a second Racepak SwitchPanel. The V-Net compatibility insures a seamless integration with existing Racepak data logger or displayed equipped vehicles, while also providing a future upgrade path for additional inputs, control modules and instrumentation, when utilized as a standalone power control module. Each Racepak SmartWire Kit includes the module, software, connector kit and USB programming cable.